Harbortown Marina – Canaveral is located in beautiful Merritt Island, FL near Port Canaveral. Between our sandy beaches, abundant rivers, and warm weather, it’s boating season all year long! Although, during the summer months Central Florida can experience its fair share of afternoon thunderstorms. It’s important to always remember safety! It is reported that more than 70 percent of the lightning fatalities occur in the months of June, July or August. At Harbortown Marina – Canaveral, we put the safety of our customers first! Our boat yard crew follows OSHA standards when it comes to lightning safety. When lightning is within 6 miles or less, our staff is required to come indoors. We reserve the right to suspend all services until weather improves, including the fuel dock and boat splashing when there are storm warnings or lightning is in the area. Our staff will remain in the shelter for at least 30 minutes after the last lightning strike. Always Check the Weather First! Mother nature can be unpredictable at times. It’s important to remember to check the weather before venturing out on your vessel for the day. Always have a plan in place for sudden severe weather. While cruising through the Banana and Indian Rivers, there are many safe harbors along the shore lines. Know where they are at all times. Download the Harbortown Marina App on your Smart Phone for an area weather forecast and keep local weather from NOAA at your fingertips. Listen for Thunder in the Distance! It’s not uncommon for the sun to be shining bright to the east and to see dark clouds to the west. If you hear thunder, know that lightning is on the way. Boating Magazine reports that if you count the seconds between the lightning flash and the thunderclap and divide by five, you will have a rough estimate of the distance in miles you are from the storm. If you can’t make it to shore – reduce your chances of a strike! 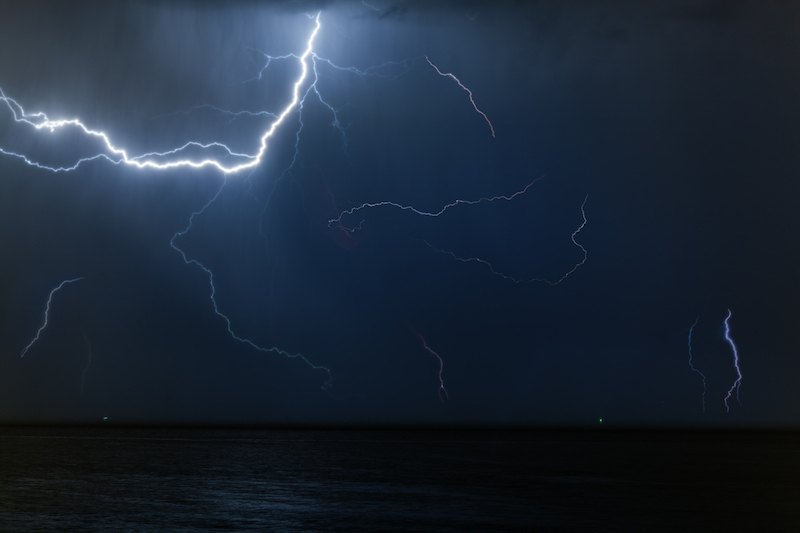 We know that lighting strikes the highest point – That would be the top of your boat. If you are stuck in the water on your vessel, Boating Magazine recommends putting on your lifejacket and searching for a protected area where you can be blocked from the wind and safely drop your anchor. Remove any metal jewelry and stay away from metal objects. If you have a cabin, go inside. Lower riggers and secure fishing rods. Depending on your boat, your safest location will be low and away from metals.